Adding to the responses above - it is pretty informal. I did mine on campus and they didn't even use a clear background although the actual photo turned out alright. thank you to all who answered my photo question!! does that mean the e-copy will be free, and one would receive it regardless of having/not having bought the physical copy? 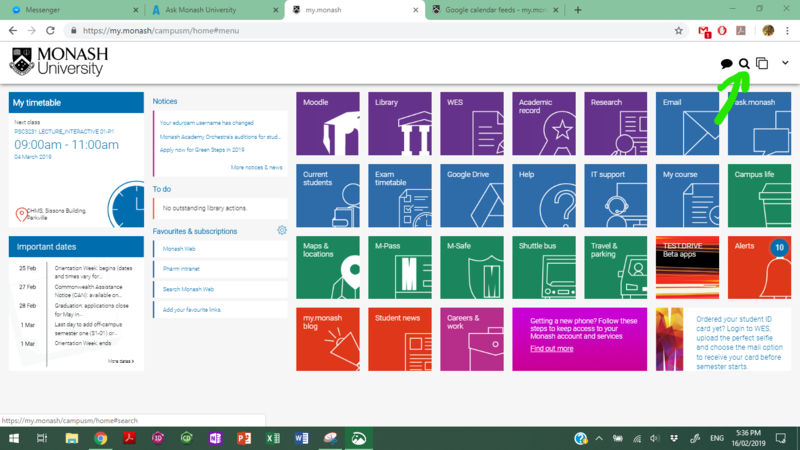 not sure on whether on the terms on getting the text but it would be best to wait until week 1 of uni until you start buying textbooks since your unit coordinators will let you know whether they are necessary and how much you will use them. Hey! So I'm doing French Proficient (ATS 2065 + 2066) this year and I read something about a 'course reader' on one of the subject reviews? Apparently there's a new one each year. There's nothing about it on my booklist though - any idea when/if I can get any information about this? Also, apparently the prescribed grammar book isn't necessary - can any French students confirm this? I looked at the contents online and it looks like pretty much the same grammar I did in year 10-12 French so probably I don't need it? What's the difference between Radiation Sciences and Radiography and Medical Imaging, and which one is more geared towards treating cancer patients? Hi there! I’m currently in third year of radiography at Monash. Radiography is more about taking medical imaging procedures, such as x-rays, CT, MRI, mammograms, operation work, trauma scans and procedures under fluoroscopy such as angiograms and injections. It’s a 4 year bachelor/honours degree, you get an internship and a lot of practical experience. Personally I think it’s a great career! Radiation sciences is a bachelor degree that comes under the bachelor of health sciences- this encompasses four primary courses. I believe first year is a fairly general year of health, while second and third year look more at the process of radiation therapy. Please do note that you do not graduate as a professional with this degree. It will enable you to enter a master of radiation therapy which will allow you to practice, but you do also get some practical experience in the later years of this course. However, from this course you can also masters in practical sonography, or even get into either masters from the radiography course. I believe now radiation science is commonly used for students as a pathway into radiography (as biomedical is to med), but if you’re looking at radiation therapy (which means treating cancer patients), it is a great option to give you experience and background in the field. I would highly recommend doing a tour of some radiology clinics or departments as well as radiation therapy and see which field you’d prefer. Radiation therapy is a very small field but I believe is expanding so do some research ask questions of people studying (feel free to pm me I know lots of people in both degrees I can put you in contact with!) to see what path you want to take. I’m looking at radiation therapy after working in radiography for some years too so if you’d like any more information don’t hesitate to ask! Try checking the booklist again closer to semester and, if possible, check out the bookshop on campus to see if there is one. You can also probably ask on the Moodle forums or typing an email to the unit coordinators and ask. Course readers in Arts units generally are lecturer-made notes and/or a collection of readings, so they tend to change with each year with any changes in the curriculum or minor edits due to printing errors and so forth. Unfortunately, I've never done French, so I can't answer the second question you had. Hopefully someone else can though! I just got an email saying that one of my Wednesday tutorials have been cancelled and I have to change to another one due to ‘low enrolment numbers’. This is suuuuuper annoying because my timetable was pretty much perfect. Anyway, I am able to change all my Wednesday tutorials to Friday, but there is one lecture that is only on Wednesdays. Should I just allocate myself to the learning capture thing so that I don’t have to show up to it and I can just watch the recordings? Thanks! I just got an email saying that one of my Wednesday tutorials have been cancelled and I have to change to another one due to low enrolment numbers. This is suuuuuper annoying because my timetable was pretty much perfect. Anyway, I am able to change all my Wednesday tutorials to Friday, but there is one lecture that is only on Wednesdays. Should I just allocate myself to the learning capture thing so that I dont have to show up to it and I can just watch the recordings? Thanks! Thanks! Yeah I don’t live very close so it would be too much of an inconvenience to show up for only one hour on Wednesdays. Watching the streams is also an option, thanks again. 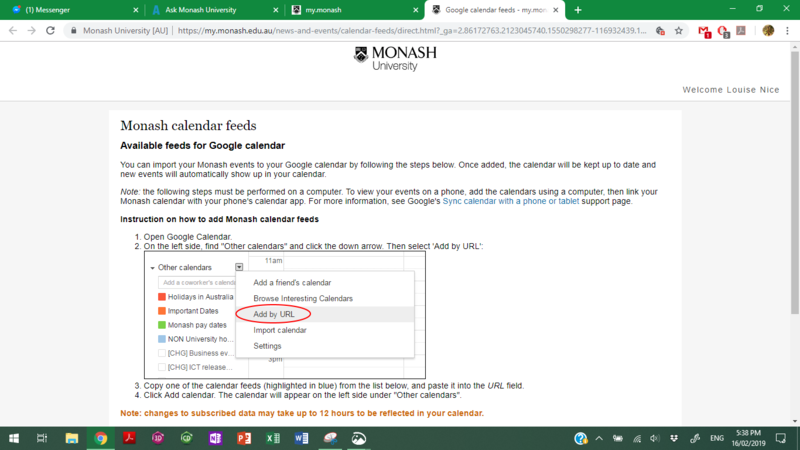 How do you import your timetable to your google calendar? It's a bit hidden, but here's some screenies. 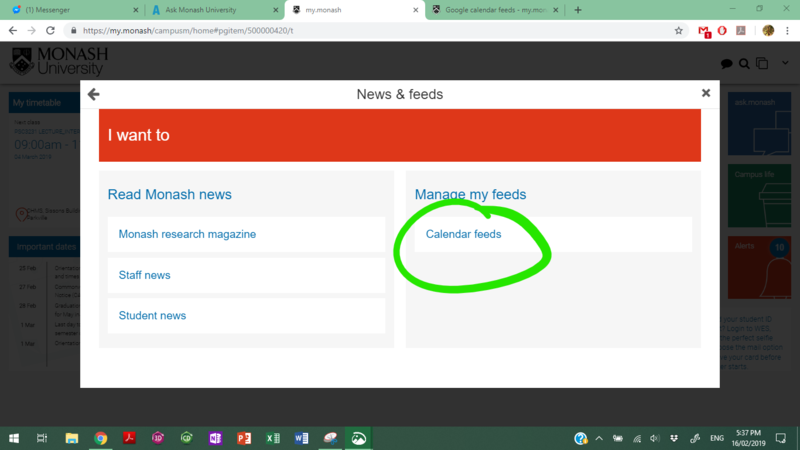 It should take you to this page which will have your timetable link for you to import into google calendar! Thanks so much. I kinda tinkered around looking for it. and did search news but I didn't scroll down enough to get to the news feed. 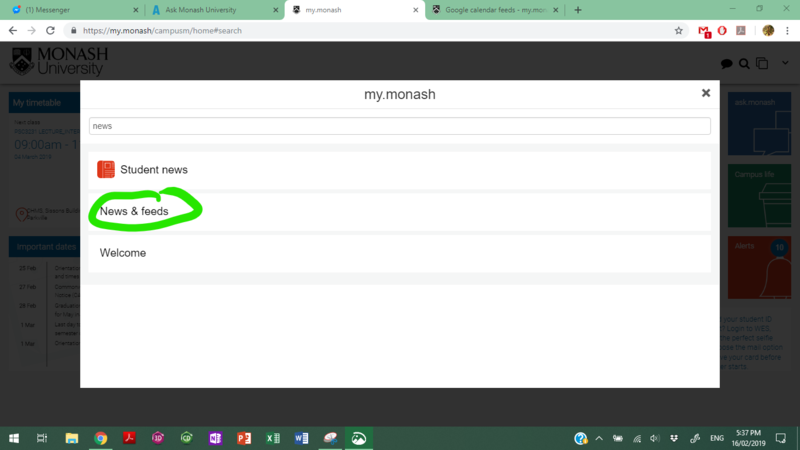 There's none specifically for the Monash Google account, but there is a whole bunch of policies regarding computer and internet use, which you can find here. In saying that, use the Monash Google account and various other accounts responsibly (and, preferably, professionally).